I didn't manage to get out in the hills over the winter. 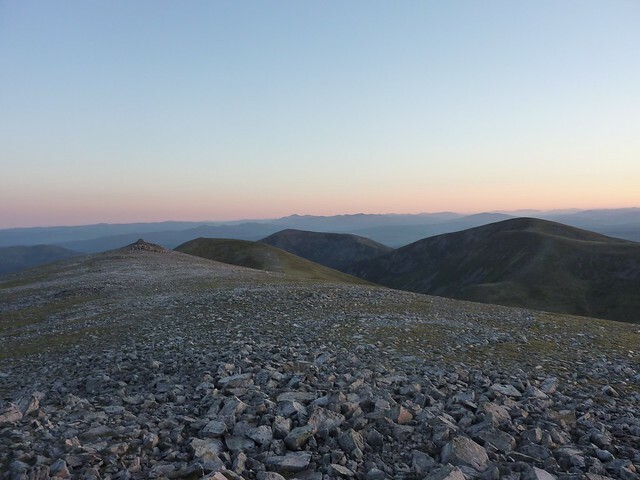 After my Fisherfield trip, I wanted to get out again and do something cool but marathon training took over and I never found the time to do anything. The weather was poor for most of May but a small window appeared for Thursday and Friday. I was working but I decided that I would experiment and see if it was possible to climb some hills without taking any time off. So, I packed up my overnight gear and booked a parking space at work. At 5:30, I left the office and drove to Blair Atholl. It's only about 80 mile but it took me a couple of hours, with a fair proportion of that getting out of Edinburgh and across the Forth Bridge. 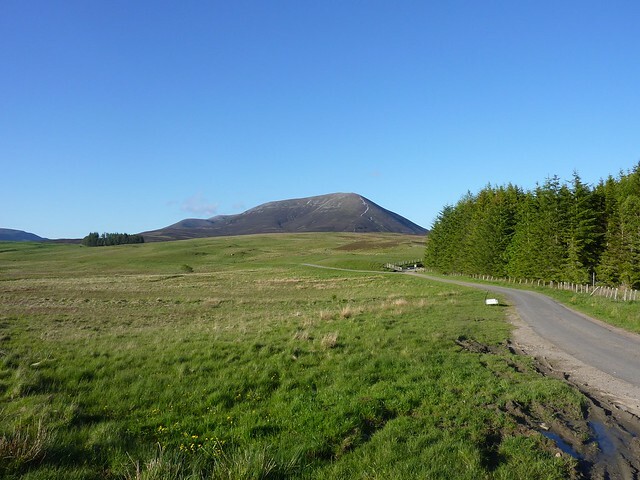 At 7:30, I was setting off in bright sunshine with barely a cloud in the sky. I decided to walk the back way in to the hill and to climb up to Bealach an Fhiodha below Carn nan Gabhar. If I had time, I'd climb the far Munro and then try to find a spot to pitch my tarp as high as I could get. The first few miles are on a farm track and are easy walking. The sun was making me sweat but it was pleasant and certainly better than sitting in front of the television. I paid particular attention to the map to make sure I didn't miss the path junctions. Still, I managed to lose the path through the heather heading up below Beinn Bheag. I found it again eventually and then wondered how I had lost it - it's a bit of a muddy gash in the hillside, in the rain it must be a quaqmire. I hit the bealach after 2 hours of walking. 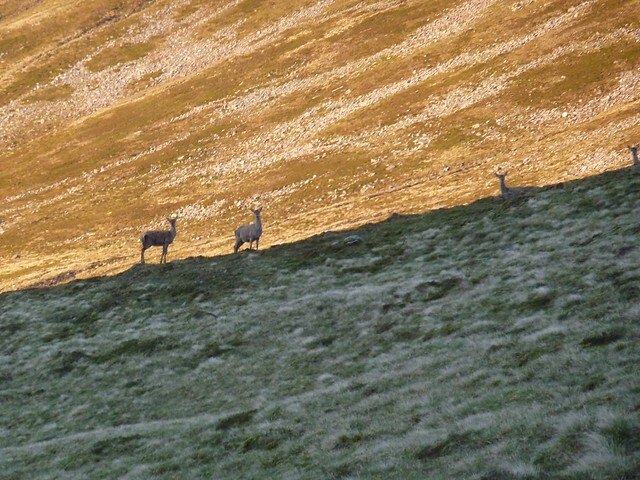 There was still plenty of daylight left, so I ditched my pack and headed up Carn nan Gabhar, disturbing a herd of deer as I went. The climb onto the ridge was easy but the first top is a mess of boulders and I was struggling a bit with a sore big toe to clamber over them without pain. I jogged along to the trig point and took a few photos, before turning around and jogging back to my pack. 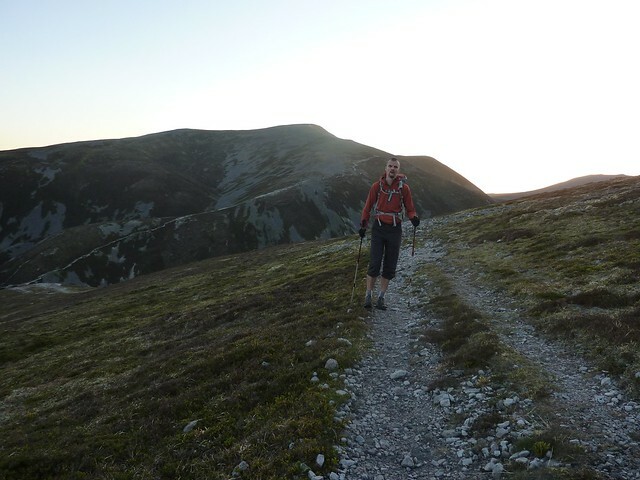 It was still not long after 10pm, so I set off up Braigh Coire Chruinn-bhalgain. The climb was pleasant in the fading light but I knew I needed to find an overnight spot fairly quickly - I was starting to get hungry. I don't normally eat my dinner at 11 at night. I found a spot just below the summit on some mossy flat ground away and set up my tarp. It wasn't particularly simple to setup - it was a bit windy and the ground beneath the moss was stony and hard and getting my pegs to bite was a pain. Eventually I got it up and I reinforced the pegs with rocks. I got my stove going and settled in to enjoy the view. My stove took an age to boil the water for my dinner (Lamb Jalfrezi from Fuizion - excellent). I need a better windbreak, I think (and the gas canister was running a bit low so it didn't have much pressure). So, it was well after 11 before I ate my meal and then settled in to sleep. I woke up before 4am and although the sun hadn't risen yet, it was very light. I lay for a while and then decided to make a move. 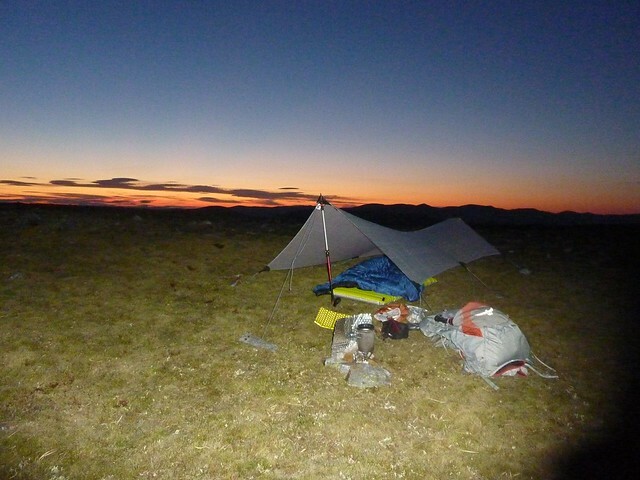 A quick bit of breakfast and packing up only took me about 15 minutes, so I was heading up the Munro at 4:20am. My toe was really bothering me now and walking downhill was painful, not helped by the rocky terrain on the descent to the bealach below Carn Liath. The sun started to show at about 4:30. 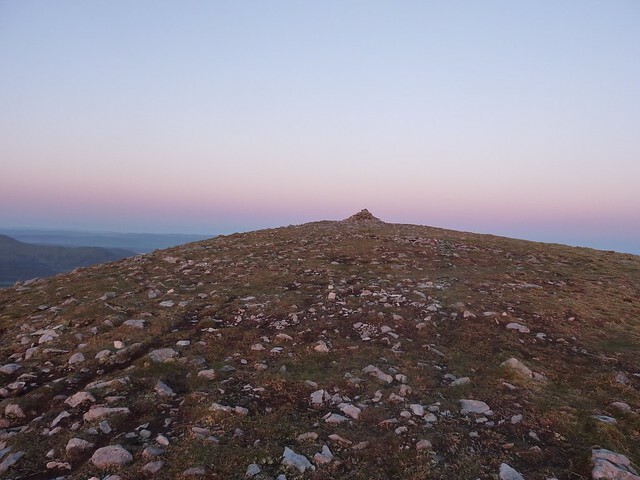 The summit of Braigh Coire Chruinn-bhalgain. The walking on Beinn a' Ghlo was all very straightforward with barely any steep climbing or difficult descents. If my toe hadn't been sore, I'd have been able to run down the second hill. Heading up Carn Liath with Braigh Coire Chruinn-bhalgain in the background. 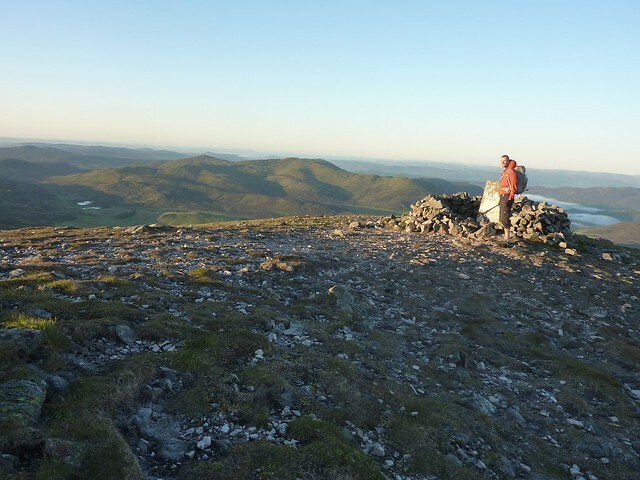 I was on the top of Carn Liath not long after 5am. I had to get back to work though, so I didn't linger and started to jog off down the steep track. I was back at my car by about 6:15am and then had the pleasure of a 2 hour drive back to Edinburgh and a 4 mile tailback over the bridge. I must admit, by the time I got home on Friday night, I was flagging somewhat. I learned a wee bit with this trip. First, take spare socks, even for an overnighter. My socks got wet on the climb up the first hill and my feet suffered for it. Secondly, I should leave work early and get in later next time, so I can get more sleep on the hill and not have to rush. Still, all in all, it was a successful evening. Last edited by johnnyhall on Sun Jun 05, 2011 3:43 pm, edited 1 time in total. Good report and some great photos johnny. That's real dedication to the bagging cause, fitting them in between clocking off and on again. Hope your toe gets better soon. Thanks fellas. Yep, maybe a bit too dedicated - I was paying for the lack of sleep the next day. Beautiful pics Really does show that the best light and photos are to be got by high level camps. I like a good afer work hill if I can squeeze one in, but it looks like a bit of bivvying can widen your choices a lot. Must try at some point. Seems well worth it for being on the summits at sunrise. Great report of the walk we did last Saturday, and I wonder if the reverse is the way to do this as we took ages to walk out. We also had bad weather so didn't make the last Munro. 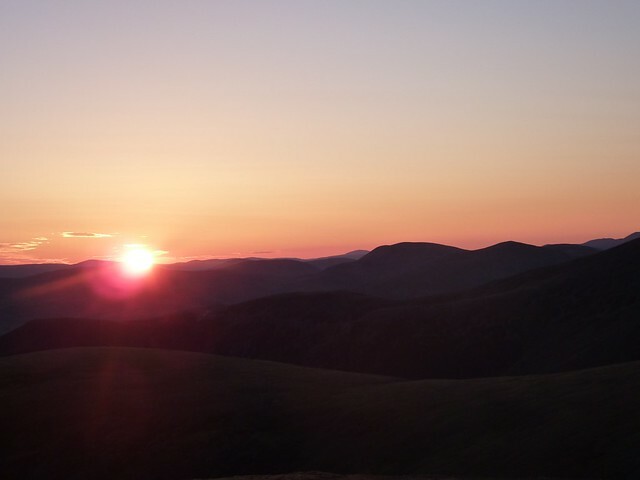 Some great pics with fabulous light..and wild camping on the top - magic ! Now that's what I call stylish! Must try that idea sometime!